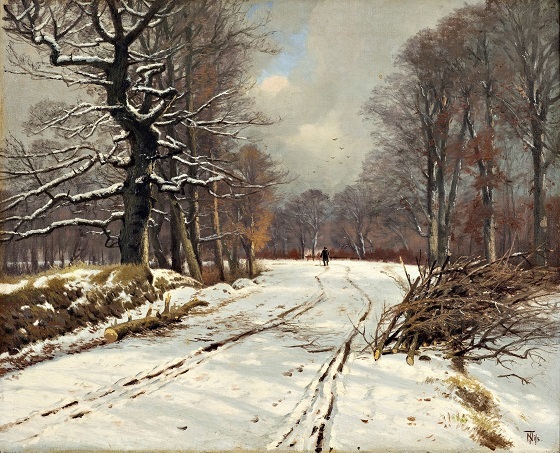 Winter landscape of forests near Hillerød, n.d. , u.å. Oil on canvas, 72 x 89 cm. A solitary man is walking down a forest path in a winter landscape near Hillerød, Denmark. The grey clouds that fill the skies above only allow a little sunlight to penetrate down to the snow-blanketed forest floor, while gnarled and naked trees flank either side of the path. The position of the man in the horizon shows that the primary subject of this work was nature itself. This was what Thorvald Niss wanted to reproduce. For example, the artist has subtly captured how the shadows from the naked trees create a dynamic play between shades of grey and white in the snow. At the same time, the gloomy cloud formations in the sky, the broken off branches on the path and the solitary person on the horizon help give the painting a melancholic feel.